Posted May 18, 2015 by Tobias Forrest & filed under Episodes. In our fifth visit to Game of Thrones this year, Dany made some questionable decisions, Aemon Targaryen advised Jon to ‘kill the boy and let the man be born’, Brienne refused to abandon her oath and Stannis appointed himself Westeros’ official guardian of grammar. Elsewhere, Sansa struggled to cope in her old home of Winterfell. Following Barristan’s death during Episode 4’s shock climactic moments, we picked up the story this week with Missandei tending to Grey Worm’s wounds. Since their introduction there has been an element of will-they/won’t-they to Missandei and Grey Worm and this week it was good to see a further development to their relationship. When Grey Worm learns of Barristan’s death he laments that he ‘failed him,’ however, he admits, ‘I fear I never again see Missandei.’ No doubt their love for one another will further grow across the season but, for the time being, it remains on the back-burner. In some of our favourite scenes from the episode, Tyrion and Jorah continued their journey towards Meereen where Daenerys resides. 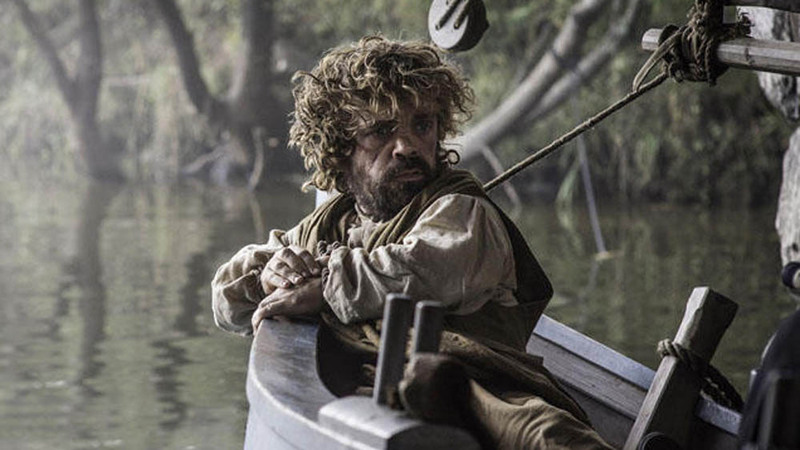 Tyrion was still Jorah’s prisoner, but that didn’t stop the wily dwarf from trying to barter his way to freedom in the way only Tyrion knows. Unfortunately for him, Jorah was less than receptive to his pleas. The situation took a turn for the worse when, as they sailed through Valyria, they were attacked by Stonemen. It was a testament to the skills of actors Peter Dinklage and Iain Glen that the scenes came over as mesmerising and gripping as they did. And with Jorah concealing his greyscale from Tyrion, there’ll sure to be a lot more drama to come. There was a sense this week of big plans slowly coming towards their fruition. After an age of camping out at Castle Black, Stannis finally decided to begin his march to take Winterfell from the hands of the Boltons. Presumably, Stannis could no longer tolerate the grammatical errors arising from many of the Night’s Watch. It’s been an interesting dynamic with Stannis watching over Jon’s rule as Lord Commander, however, we felt that it was about time that the would-be King of Westeros finally put his words into actions. Elsewhere, Roose Bolton had plans of his own and revealed, to a stunned Ramsay, that Fat Walder Frey was pregnant. Unsurprisingly, Ramsay was less than pleased by the pronouncement and feared for his current position although we have little sympathy for him. This week also saw the moment we’d been waiting for since Theon betrayed the Starks when Sansa finally discovered his presence among the dogs at Winterfell. 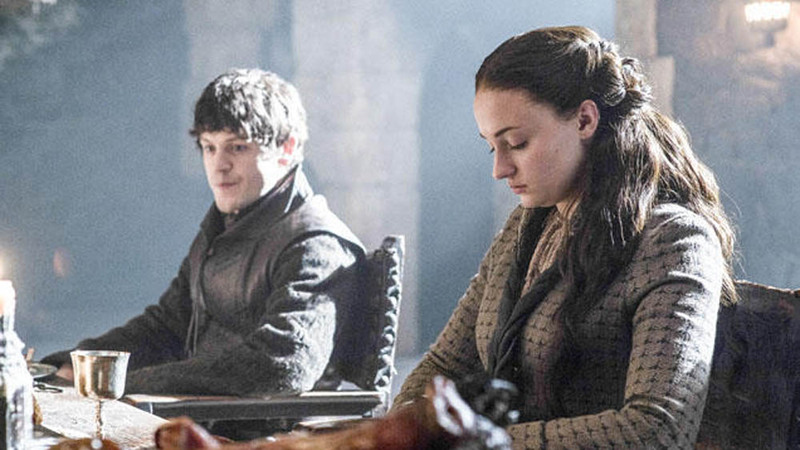 At dinner, Ramsay gave into his theatrical side as he coerced Theon into apologising for killing Sansa’s younger brothers; however, as the audience knows what really happened it can’t be too long before Sansa discovers the truth. Amongst all the drama at Winterfell, if there’s one thing we can be sure of, it’s that marrying Ramsay will be a fate worse than death for Sansa as the young Lord shows no signs of changing his spots. ‘I don’t want to overfeed them,’ said Dany after she fed one of her prisoners to Rhaegal and Viserion in a scene that warned of where the Queen’s current path might lead her. Where before Dany has rarely shown mercy it has come as a matter of necessity, here it was cruel, brutal and reminiscent of her father, the Mad King’s deeds. It’s good to see Daenerys progressing out of the rut the character had been driven into and, with her decision to reopen the fighting pits, it feels as if the narrative is finally moving forward in Meereen. Back at Castle Black, Jon negotiated with Tormund in the latest attempt to get the Wildlings to fight for Stannis’ army. Unlike Mance Rayder’s stubborn refusal, Tormund appeared more willing, if a little apprehensive, to agree to Jon’s request. On the condition that Jon accompanied him to the Wildling camp, of course as a guarantee that the Night’s Watch will not betray their trust. Life rarely runs smoothly in Game of Thrones and we’re sure that a little more chaos is just around the corner, but whether Jon or Tormund benefit from it remains to be seen. Overall, this was a solid and entertaining episode with a myriad of strong performances masking some inconsistencies in the writing. Aired at 9pm on Monday 11 May 2015 on Sky Atlantic.